Your guest list includes cherished relatives and friends who have come together to share in your joy! And this elegant interlocking hearts guest book makes it easy to record their names while also providing a lasting keepsake that holds memories for years to come. 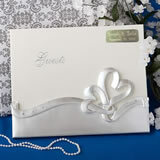 Perfect as an accessory for a heart themed wedding or to add elegance to any wedding celebration, each interlocking hearts wedding guest book from Fashioncraft's Finishing Touches Collection of wedding accessories measures 9 7/8" x 7 7/8" and has a white poly resin detailed/carved interlocking hearts appliqué on the cover with interior pages designed for your guests' best wishes. 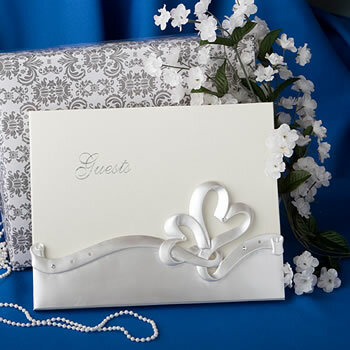 Each elegant guest book comes delightfully packaged in a clear topped box with a slate gray and white damask design base for storage after your wedding day is through. Item very stiff and not as nice as it appears online. Did not use. Gorgeous and great price! Also adds a touch of class to the wedding! Love it. Cover is beautiful however, it would be nice if the front page had a detailed event information sheet. This book is a memory piece sake. Thanks. Purchased this along with the matching pen set. We really loved the quality of both items. My daughter thought they were perfect and we got compliments galore. Thanks so much for making a special day more special!! I was very pleased with the guest book i ordered. I was a little hesitant to order it because the description did not state how many pages were in the book. However, when it arrived, there were plenty of pages!